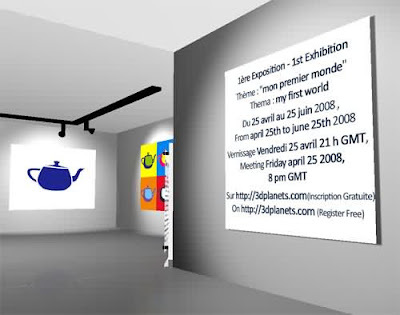 MixED has already a date for the first personal exhibition, that will be from June 25 to August 25 of this year (2008). The featured artist will be Mr. Phillip Sand Hansel II. Image of the opening of MixED. Image by MixED. Mr. Phillip has been a very active member of the VRML and Web3D community of worldbuilders for many years. He was in VRML since the beginning.He has been in the main communities of multiuser VRML like Blaxxun's Cybertown from the beginning, and did great tutorials and 3d models in his site (The World Builders Guild). Blaxxun and VRML had no secrets for Mr. Phillip. Recently, his background story in VRML has been published in MixED, in French and English. As new details of the exhibition are known, I'll post here. Also keep informed checking MixED frequently.